This entry was posted in Domestic violence, Domestic Violence Homicide, Fatal male violence against women, Femicide, Male violence, Male violence against women, misogyny, Sexism, Violence against women and tagged #domestic violence homicide, #femicide, #feminism, #GabrielleStanley, #Halloween, #JaneClough, #JonathanVass, #justice, #male violence, #male violence against women, #NicoleWaterhouse, Domestic violence, misogyny, Violence against women. Bookmark the permalink. I agree we all like to have fun but looking at that image made me feel sick. about 2 women a week are killed by a man known to them in the UK every week. its not so funny now is it? 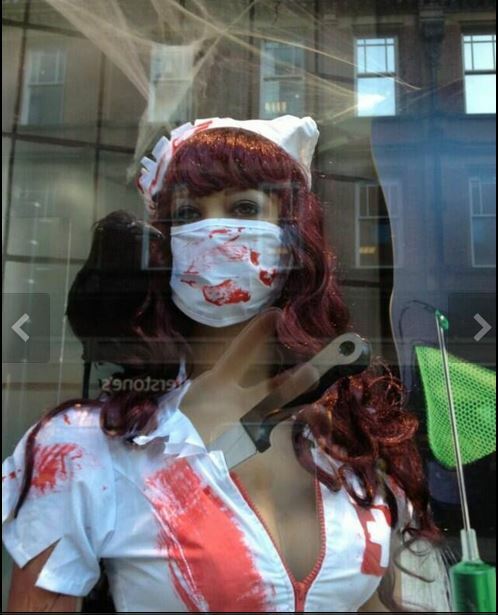 Oh yes isn’t it funny having a female mannequin put on display in a shop window with a knife through her body!! Men continue to trivialise male violence against women and girls because said violence is always just ‘another isolated incident’ not a male pandemic! Note too how this female mannequin is depicted as ‘every man’s sexualised fantasy!’ Further proof men don’t believe women are human but instead believe women exist solely to sexually service males!